Qui a lato vedi la terra nel suo movimento di rotazione intorno al suo asse; questo movimento si chiama rotazione. 23 ore 56 minuti 04 secondi. Questo è il giorno siderale. Per compiere invece un giorno solare si prende come riferimento il sole e quindi la durata è leggermente superiore: 24 ore (si tratta comunque di un tempo medio poiché la durata è influenzata anche da altre cose). Taking the celestial sphere (that is all the stars but the Sun) as reference, the Earth completes a full rotation (a turn around its own axis) in 23h, 56m, 04s. As previously mentioned, this is the sidereal day. On the other hand, if we take the Sun as reference (see picture) a full turn (or better, the time elapsed to newly get the Sun on the same position in the observer’s sky) takes 24h (average duration, for the exact motion is affected by a lot of other effects). This interval is called solar day. The angle θ is about 1°: the Earth takes 365 days to complete a revolution (see below) around the Sun, hence every day it moves 360°/365 ≈ 1° along its path (the orbit is not really a circumference but quite close). Further, since the Earth rotates on its axis in 24h = 1440 minutes, it takes 1440/360 ≈ 4 minutes to rotate 1°, which is right the difference between the solar and sidereal days. La terra poi ruota, insieme agli altri pianeti del sistema solare, intorno al sole; questo movimento è il moto di rivoluzione, che, come tutti sappiamo, dura un anno. Qui accanto vedi una animazione (non in scala) che chiarisce il concetto. Beyond the rotation, the other major motion of the Earth (and of all solar objects) is the revolution, that is the orbital motion around the Sun (which, incidentally, takes 1 year …). Aside you can find an animation (for obvious reasons, sizes and distances are not properly scaled) to help understanding. Tutti i pianeti ruotano all'incirca sullo stesso piano ad eccezione di Mercurio (orbita inclinata di ~7°) e Plutone (orbita inclinata di ~17°); tutti gli altri hanno un'inclinazione dell'orbita che sta entro ~2,5°. 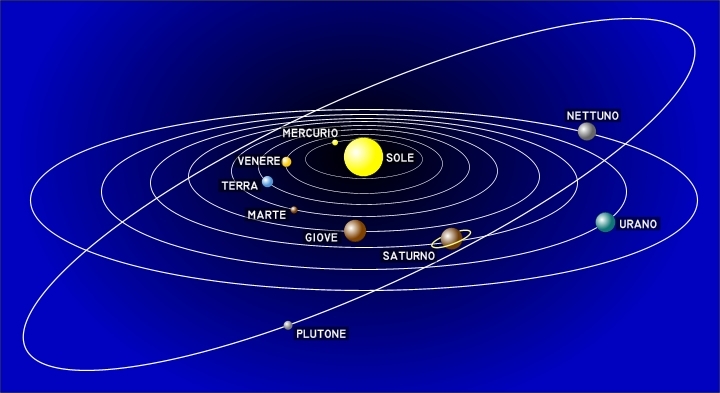 Plutone è stato recentemente declassato e qui è stato riportato solo per ragioni affettive. In the above picture, instead, the objects’ size are properly scaled (not the distances, though; one thing at a time …). Altra caratteristica che differenzia i pianeti tra loro è il tempo di rivoluzione; quelli vicini al sole sono più veloci di quelli più lontani. Nella tabella accanto trovi i valori della rotazione e della rivoluzione. Venere ed Urano hanno un segno meno accanto al valore della rotazione ad indicare che il senso di rotazione di questi pianeti è retrogrado, cioè ruota in senso opposto rispetto agli altri. So far, we have seen that the planets differ each other by size and orbit. Another proper value is the revolution time, that is the planet’s own year duration. On the following table, rotation and revolution times are summarized. A minus sign on the rotation time means the planet has a retrograde motion (spins in the opposite way, that is). Qui sotto troviamo i pianeti alla giusta distanza ma non in scala per ciò che riguarda le dimensioni. In the picture below, it’s the turn of the mutual distances to be properly scaled (and the dimensions to be not). 109 km = 1 billion km = 1-and-9-zeroes km. Il piano immaginario su cui ruota la terra si chiama eclittica; possiamo però pensare all'eclittica anche come al piano su cui ruota il sole attorno alla terra. Questa ultima affermazione rappresenta il punto di vista di un terrestre. 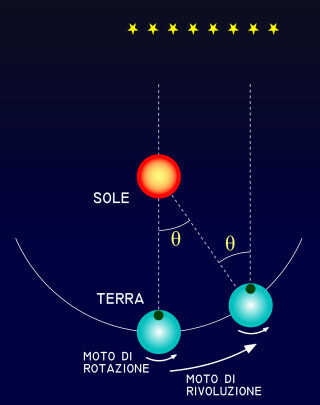 L'asse intorno a cui ruota la terra non è perpendicolare al piano dell'eclittica ma è inclinato di un angolo di circa 23,5°. E poi, per complicare le cose, l'asse terrestre ruota a formare un cono come nel disegno accanto. Questo moto si chiama moto di precessione. L'asse di questo cono punta verso la costellazione del Dragone e questo punto si chiama Polo Nord Eclittico. L'asse del cono è perpendicolare al piano dell'eclittica. To make things even more complicated, such an axis also revolves shaping a cone, as shown on the picture. This kind of motion is called precession. The axis of the cone aims at the constellation of Draco and the such an imaginary point (intersection of the axis with the celestial sphere) is called ecliptic north pole. The cone’s axis is perpendicular to the ecliptic. To be precise, our Earth suffers a lot more motions, though for our purpose considering rotation (duration 24h), revolution (duration 1 year) and precession (duration 26000 years) is fairly enough. A causa del moto di precessione, quindi, il polo nord celeste (PNC), che si trova sul prolungamento dell'asse terrestre, cambia col passare dei secoli. Questo significa che il riferimento che noi usiamo in cielo per localizzare il PNC varia col tempo. Ai giorni nostri noi consideriamo il PNC quasi coincidente con la stella polare; tuttavia nel 2800 a.c. il PNC era rappresentato dalla stella Thuban della costellazione del Dragone, e tra circa 12.000 anni la stella rappresentativa della direzione nord sarà Vega. Because the precession, then the NCP (North celestial Pole) moves as well and that means any sky reference used to visually localize NCP varies on time. Nowadays, we usually consider NCP almost overlapping the star Alpha Ursa Minoris, known to many as Polaris. In 2800 BC, though, the NCP was near Alpha Draconis (Thuban) while in several millennia Alpha Lyrae, alias Vega, will become the polar aiming reference. Come visto sopra, la direzione dell'asse terrestre cambia molto lentamente (26000 anni di periodicità) per cui possiamo ritenerla fissa durante la rotazione della terra attorno al sole; poiché l'asse terrestre è inclinato appare chiaro che esisteranno dei periodi dell'anno che saranno maggiormente illuminati e riscaldati dal sole ed altri che lo saranno meno. La variazione di riscaldamento dipende sia dalla inclinazione dei raggi solari che dalla durata della illuminazione; è invece trascurabile la variazione di distanza tra la terra e il sole. Questo fenomeno provoca le stagioni. Le stagioni sono dunque possibili proprio perché l'asse di rotazione terrestre è inclinato. However, the Earth axis variations are very-long-period ones and we can completely neglect them while considering our usual time spans. Hence, we can ignore them during a single revolution of the Earth around the Sun. Now, since the Earth axis is inclined on ecliptic plane, it should be clear that a certain location on Earth surface receives different amount of solar lighting (both for daylight duration and inclination of rays) during the year. This phenomenon leads to what we call seasons. Therefore, the seasons come out from the inclination of the axis on the ecliptic, while (just in case somebody thought differently) there is no practical relations with increased or decreased distance from the Sun during the year. I giorni in cui la durata della notte e quella del giorno sono uguali (12 ore) si chiamano equinozi, il giorno in cui la durata del giorno è massima è il solstizio d'estate mentre quello in cui la durata del giorno è minima è il solstizio d'inverno. The days in which the daylight and night have the same duration (12 hours) are called equinoxes. We have two of them in a year, in spring and in autumn. The day in which the daylight has the longest duration (in the year) is called summer solstice, while when it has the shortest, is called winter solstice. Al solstizio d'estate il sole, al momento della sua culminazione, è più alto di 23,5° rispetto alla culminazione durante l'equinozio. Al solstizio di inverno il sole, al momento della sua culminazione, è più basso di 23,5° rispetto alla culminazione durante l'equinozio. Come appare nel disegno precedente il sole sorge esattamente ad est e tramonta esattamente ad ovest nei due giorni degli equinozi. Col passare dei giorni e delle settimane, il punto in cui sorge il sole e quello in cui tramonta variano. Puoi fare facilmente questa verifica osservando ad intervalli di alcune settimane l'alba e/o il tramonto. Fissata una latitudine, l'equatore celeste è fisso in cielo; si tratta dell'arco che va da est a ovest ed è alto di un angolo pari a 90°-Latitudine. L'arco che compie il sole in cielo, dal nostro punto di vista, varia invece col passare dei giorni e dei mesi. As it can be seen in the picture, the sunrise happens exactly due east and the sunset due west while in the equinoxes. Through the year, sunrise and sunset points moves along the horizon. Hence, by definition, the ecliptic itself varies. Anyhow, that does not apply to the celestial equator, which remains steadily dependant on latitude only. 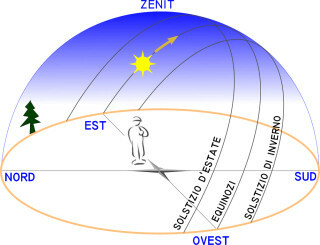 As it can be seen in the picture, while in the equinoxes the sunrise happens exactly due east and the sunset due west. Through the year, sunrise and sunset points moves along the horizon. Take a building or a hilltop as sighting reference and check yourself. As a consequence, we can guess that the observed trajectory of the Sun traced by a place on terrestrial surface somehow varies as the year flows. Anyhow, that does not apply to the celestial equator, which can be considered steadily dependant on latitude only.